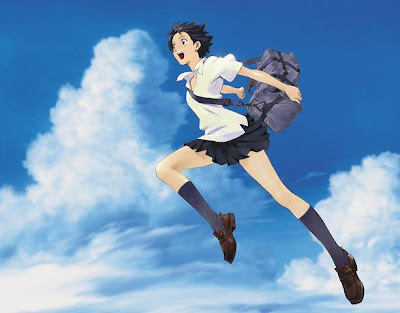 BLACK HOLE REVIEWS: THE GIRL WHO LEAPT THROUGH TIME (2006) an anime hit? 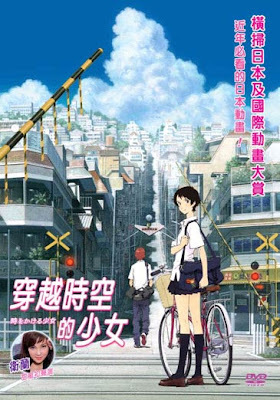 THE GIRL WHO LEAPT THROUGH TIME (2006) an anime hit? This animated feature film from Japan is heading for a limited cinema release in the USA in June. It’s one of the few anime movies that isn’t directed by Hiyao Miyazaki to get the chance, though having seen it, I’m uncertain why it has been picked out. Possibly because its visual look is quite similar to a Miyazaki. But this has been animated at Madhouse Studios, rather than Ghibli, and directed by Mamoru Hosoda. The almost photo-realistic look achieved with the colouring and ‘lighting’ of modern city scenes, shows a careful and beautiful artistic approach to traditional 2-D animation that’s been abandoned by the big western animation studios. It still uses 3-D animation as a way of portraying certain moves and special scenes, like the time-travel space she falls through, but essentially you won’t see flat animation this good outside of Japan. It’s a drama and a comedy, but I was expecting something a little more sci-fi, but this is more like Somewhere in Time or Sliding Doors, but without the snogging – mainstream Japanese romances usually avoid any physical contact whatsoever! I was hoping to see something new done with the time-travel angle, but the timespace limbo she falls though was rather sparse and functional. The only impressive visual effects were some beautiful frozen-time tableaus. It’s well-directed and a story well told, but I was underwhelmed by the familiar time-travel paradoxes and the frustrating Dawson’s Creek neuroses of the main characters. 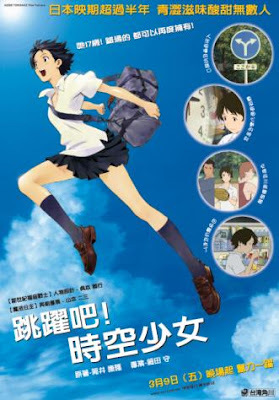 Where the recent, hugely popular Miyazaki films have usually been set in fantasy lands, The Girl Who Leapt Through Time is in present day in a high school (like so many anime series). I wondered exactly why the story was chosen for animation rather than live-action, as the many dialogue scenes begged for real actors, and could easily have been filmed in actual locations. I wasn’t surprised to find that the characters, created by Yasutaka Tsutsui (who also wrote Paprika), had appeared in two live-action movies before – both called The Little Girl Who Conquered Time, filmed in 1983 and 1997. Perhaps these will get a re-release to follow on from the anime’s success. The theatrical release in the US means that a DVD release will eventually happen, but you’ll have to wait a little longer. I watched the Hong Kong region 3 DVD from Kadokowa Video, which has anamorphic widescreen and good English subtitles. It’s also already out in France and Germany. DVD Beaver has also looked at this disc and published some nice non-spoiler framegrabs.